In these lessons, examples, and solutions, we will learn how to find prime factors using factor trees and repeated division. The prime factors of a number are factors which are prime numbers. We can find the prime factors of a number by repetitive division or stacked division. To find the prime factorization of the number, we need to find the prime factors that when multiplied together gives the number. Find the prime factors of 36. 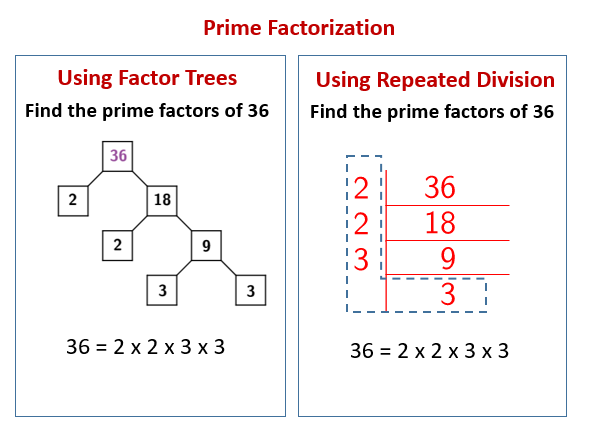 The following diagrams show Prime Factorization of a number using Factors Trees and using Repeated Division. Scroll down the page for more examples and solutions of prime factorization. The prime factors of 36 are 2 and 3. To find prime factors using the repetitive division, it is advisable to start with a small prime factor and continue the process with bigger prime factors. Examples of how to use stacked division to find the prime factorization of a number rather than making a prime factorization tree. A number is divisible by 2 if it is even or ends in 0, 2, 4, 6, 8. A number is divisible by 3 if the sum of the digits is divisible by 3. A number is divisible by 5 if it ends in 0 or 5. Use division to find the prime factorization. Use division to find the prime factorization of 6,552. Prime factors of a number can be found by using upside down division.